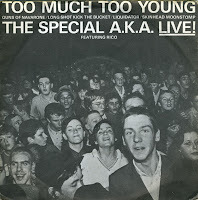 Renowned for their live shows, The Specials released a 5-track live EP in January 1980 as their third single. The EP features 'Too much too young' and 'Guns of Navarone' recorded live in London and 'Skinhead symphony', which was recorded at Tiffany's in Coventry. The lead track 'Too much too young' is based on the 1969 song 'Birth control' by Lloyd Charmers. The song became an instant smash hit, topping the UK singles chart for two weeks in January 1980. In the Netherlands, it reached number 13.